Monty Biyela talks to us about the hardships and successes. Nine years ago, Monty Biyela (31) applied for a job as a waitress but she didn’t get it. Instead, she started out as a receptionist in 2007 at a company that sold fire extinguishers but quickly became bored sitting behind a desk. She tried to get a waitressing job at a local coffee shop a few months later but was told that there weren’t any vacancies. Little did she know that greater things were in store for her. 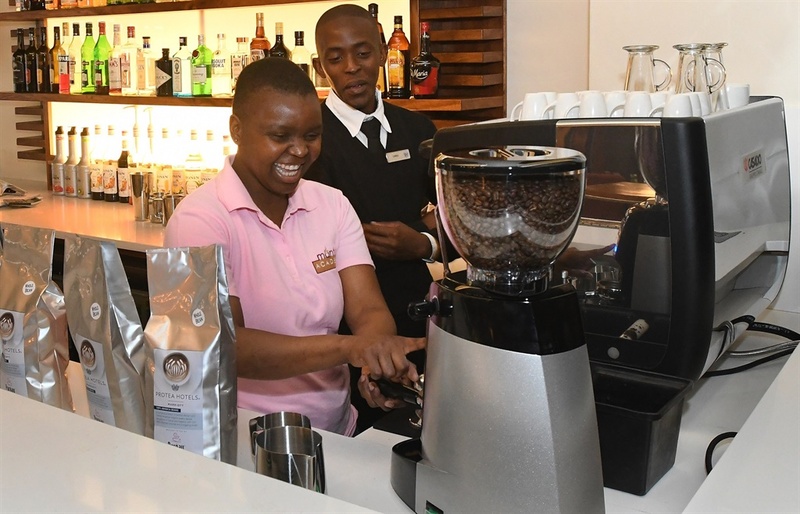 After spending eight years roasting beans at 4th Avenue Coffee Roasters and becoming a certified barista, Monty was approached to train all the baristas at a big hotel chain with 16 hotels in Cape Town, Johannesburg, Durban and Port Elizabeth. 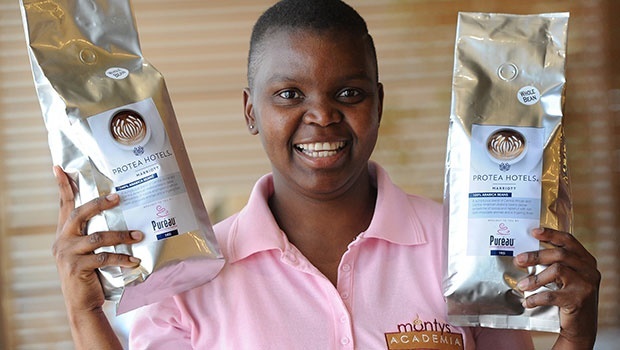 She now also runs a coffee training company under the name Monty's Academia, which was registered earlier this year. Monty shares her story of having the grit to take a risk and how it ended up in rising success. 1. Tell us about your journey to first obtaining a job as a barista. I was eager to try something new so I accepted a post as a barista in 2008 in Johannesburg. I was sent for training and finally discovered my true passion – coffee! I found that I was really good at it. I fell in love with being a barista. And then Ian, the owner, opened up 4th Avenue Coffee Roasters and made me the head barista trainer. After some time, I left to start my own business as a barista trainer, going from home to home and teaching people how to make the perfect cup of coffee. I eventually left that when Protea Hotels and Puréau approached me about partnering with them on a new coffee journey. 2. What is your typical work week like? My job involves training and transferring the skills to baristas working in the hotels so that they can deliver the best standard of coffee in the hotels. My days are busy but fun, and my job includes a lot of travelling. My mom – she is my pillar of faith. My father died when I was eight months old, so my mom raised me and my older sister and brother in Johannesburg in difficult financial circumstances. My former boss, Ian, is also a very wise man. He taught me that hard work will get me far in life and also stressed that I take pride in my job. If I fail, I will try again and again until I make it. 4. What was it like to venture on your own? It was very scary! But God gave me the power and the will to just do it. 5. What do you wish you knew before getting started? 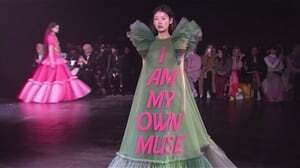 That I should believe more in myself. 6. Was becoming an entrepreneur something you always intended for yourself? I always wanted to pursue a teaching career, but my father was a lawyer so I thought it would be good to pay tribute to him by following in his footsteps. There wasn’t any money for tertiary studies so I ended up looking for a day job instead, but I also always had a dream of opening my own pre-school or a cake shop. But I always knew I would end up teaching someday. 7. How comfortable are you with failure? 8. What was the single most important decision you made that contributed to your success? It was honestly about being brave enough to face my fears. It's not easy being the boss since I am responsible for all decision-making (laughs). 9. What prevented you from accomplishing your goals? The capital to start my business. 10. And how did you refuse to accept that as an obstacle? I told myself that God will make a way for me, and He did. And my advice to people is that they should not give up. There are many companies that offer help, such as Masisizane Fund. 11. How do you maintain a work-life balance? It's so necessary to unwind. I go to church, bake cakes and I really enjoy reading religious books. One of my favourite books include Andrew Wommack's You've Already Got It! 12. What are the pros and cons of your job? A pro is definitely that I get to travel and meet many new people who inspire me and whom I also encourage. On the challenging side, I also find travelling on my own a bit daunting. 13. What specific traits or characteristics does your job require? It requires a pocket full of patience and the love to teach others. It also requires you to be a strong person in character since most baristas are men. I find that many men find it intimidating for a woman to teach them or to be really good at their job, so I've had to prepare myself to face this as I go along. 14. What used to be your biggest weakness and how do you overcome it? I used to find it difficult to teach more than 15 people at once, but I have since completed a facilitator course that has taught me how to deliver my information to many people simultaneously. 15. What has been your most rewarding accomplishment so far? All the learning and experience I've been receiving as an entrepreneur has been very valuable to me. If you did not attend university, it's not the end of the road for you. 16. What advice can you give to people who keep trying but don't succeed? Never give up, and make sure you are in the right business. If you love what you do, everything will work out. To every entrepreneur out there, I will say that the road is not easy but giving up should not be an option. If you're hardworking and have hope, your business will grow and you'll be able to create more emplpyment and build the country. Aim for the light at the end of the tunnel. 17. What qualities does it take to flourish into a successful businesswoman? Patience. Remember, a house is not built in a day. Hard work is also important. 18. What's the thing that keeps you up at night, and how do you deal with it? I'm always thinking about ways to make my business grow but I believe everything takes time so I'm not in a rush. 19. What advice would you give to your 20-year-old self? Not really, but I do wish that I had done this earlier. Women are powerful – believe in that power. 21. What about your job makes you the happiest? The fact that my job is educational and inspiring and makes a difference in so many people's lives. 22. Is there anything you would've done differently on your path to success? No. I believe that everything happens for a reason, whether they're good or bad. 23. What's your biggest piece of advice for aspiring South African female entrepreneurs? You can do anything you want if you put your mind to it. Women are powerful – believe in that power. 24. What are your short and long-term goals? My goal is to continue informing, educating and building many people into being the best baristas they can be. And I would love to open my own barista school in the future. I really love my job. I enjoy teaching people about coffee. Coffee is very broad, by the way! It has changed my life a lot, and I'm still learning so much as well. And I wish that, as I grow as a person, so too will my business grow and that I'll be able to employ more people in my business. I've discovered that so many people need jobs and I would love to be the one to make a difference.